There are three new cars on the Bentley stand this year. The firm has unveiled a concept 4x4 model, called the EXP 9 F, which could come with the company's 6.0-litre W12 engine. Also on display was a sporty version of its flagship Mulsanne, named the Mulliner Driving Specification, and a new V8 version of the Continental GTC. Vital stats and facts: Set to be the new footballer's wagon, it could come with a 6.0-litre W12 engine producing 600bhp and 800Nm of pulling power with an eight-speed gearbox. It's just a concept for now, and the manufacturer claims it could also come with 4.0-litre twin-turbocharged V8 or even a hybrid powertrain. 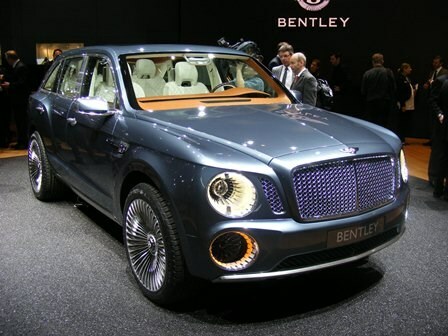 For more information about Bentley's 4x4, click here to read sister title Car Magazine's full expose. Why would you buy it? You've already got the Continental GT and you need a car for the school run or when it snows. Why wouldn’t you? It's not the best-looking car in the world, and it'll have to go up against Maserati's off-roader plus the already popular Porsche Cayenne. Prices and launch date: Not clear at this time. What else is on the stand? There's a sporty version of Bentley's flagship Mulsanne dubbed the Mulliner Driving Specification. Effectively it adds a set of 21-inch alloys, a 'Sports' setting for the air suspension, improved steering and some styling tweaks. It'll sprint from 0-62mph in 5.3 seconds and reach a top speed of 184mph thanks to its 505bhp engine, exactly the same unit as found in the 'standard' Mulsanne. Bentley has also taken the wraps off a new V8-engined version of the Continental GTC convertible, which follows on from the release of the V8 Continental. The new 4.0-litre twin-turbocharged V8 delivers 500bhp and 660Nm, allowing the GTC to accelerate from 0-60mph in 4.7 seconds. Its top speed is 187mph. Bentley isn't pursuing just pure performance with this engine, however, and claims that it also brings significant improvements in fuel economy and CO2 emissions. 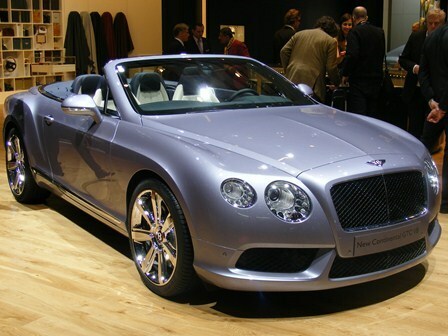 For more news from the Geneva Motor Show 2012, click here.